‘Star Wars: The Force Awakens’ Trailer Is Here! 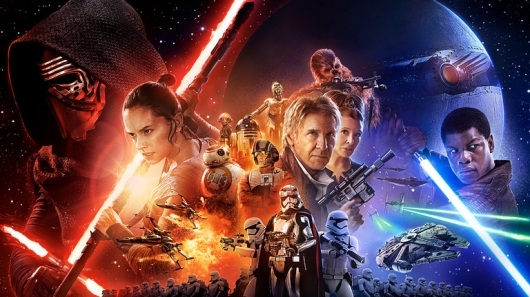 The long-awaited full-length trailer for Star Wars: The Force Awakens is here!!! This new trailer debuted on television tonight during ESPN’s Monday Night Football New York Giants vs Philadelphia Eagles game, before Disney and Lucasfilm released it shortly after online. Three teasers for this new trailer were released yesterday, along with a new poster that highlighted the split between the light and dark sides. The poster, which is the first one sheet to feature characters from the film, showcases John Boyega’s Finn with a blue lightsaber; Daisy Ridley’s Rey with a staff; Adam Driver’s Kylo Ren with his red crossguard lightsaber; the new rolling ball droid BB-88, along with returning droids R2-D2 and C-3PO; Princess Leia, Han Solo, and Chewbecca; stormtroopers; a new Death Star (!!! ), and more. But, no Luke Skywalker, although we know that Mark Hamill is reprising his role as the Jedi Master. The new trailer, though, gives us a lot more Han, who tells Rey that the Jedi were real. Still no Luke, although there’s still that cloaked person we see put their hand on R2-D2. We also get to see Leia’s face!!! Then, there’s more insight into Finn’s character, and then there’s Poe getting tortured by Kylo Ren, the Darth Vader devotee.